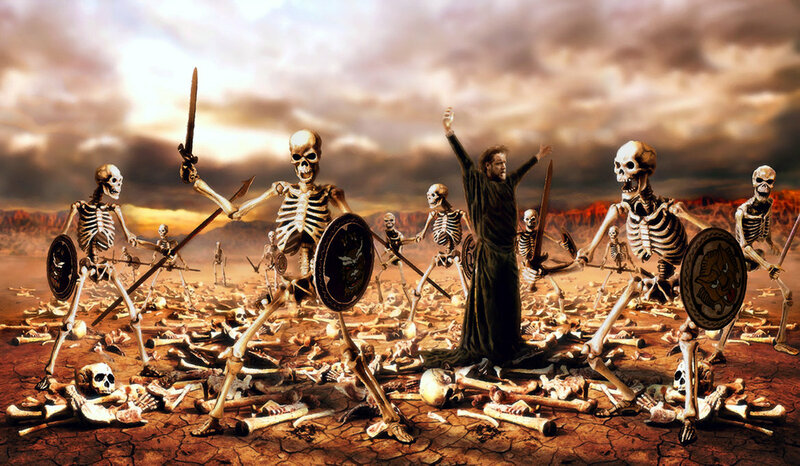 The Valley of Dry Bones…! We have been burdened to write on the following subject and trust that you will not only read this article but feel the pain for Israel too. We wanted to send this message out with such a burden that we have to release it immediately. This is a very “prophetic” message yet to be understood by the Church. We don’t have all the answers ourselves but continue to deep soul search and ask, "What are you saying, Lord!" Think on this too! When we see “a valley,” two distinct pictures readily come into view. One is of a nice serene tranquil setting, where all is slow-paced and peaceful; and another is to the parallel to Psalm 23. Comforting words since death is often viewed as a “deep, dark valley” that we must ALL pass through someday. However, the picture that God gave to Ezekiel as He showed him the “Valley of Dry Bones” was prophetic! Ezekiel portrayed to us a preview of the re-birth of the State of Israel in a unique way that has become a twentieth century miracle of enormous significance. Let’s look at Ezekiel 37: 1-14 and together break down and chew upon what is being said… "GOD grabbed me. GOD’s Spirit took me up and sat me down in the middle of an open plain strewn with bones. He led me around and among them--a lot of bones! There were bones all over the plain--dry bones, bleached by the sun," Ezekiel 37: 1-2. Yet, a remnant survived the so-called ‘Final Solution’ of Adolph Hitler’s scheme to rid the world of Jews. And, out of that great “Valley of Death,” the nation of Israel was miraculously re-born as a legitimate state among the world community of nations on May 14, 1948. This prophetic re-gathering, which we have seen take place within this century, is to serve to the world that the “Day of the Lord” draws near! So let’s continue with Ezekiel’s vision…. ”He said to me; "Son of man, can these bones live?" I said, "Master GOD, only you know that,” Ezekiel 37:3. The very site of these bones, being so many, and so “very, very dry” …indicates that the “House of Israel” would lose many members of it’s peoples throughout the course of history …while the “dryness,” reflects the utter lack of concern and sympathy Israel would receive from the world! Notice also; these “dry bones” haven’t been afforded even the courtesy of an appropriate resting place, or burial! They have simply been left open to exposure from the elements! What possible optimistic hope could this scene portray…? Thinking about this whilst writing this article simply it means …that it Wasn’t meant to do anything except to express to Israel that it’s only hope in this world rests with God’s commitment to "His" Word! Only Israel has been sifted out amongst all the rest of the nations of the world, like grain being sifted out of a basket into a field. The terminology of "Wandering Jew" has become a byword to describe this world-wide sifting of Israel (Deuteronomy 28:37). God also foreknew that Israel would become devoured by the world, yet He has supernaturally persevered a remnant of Israel all throughout history (Deuteronomy 28:63-66). As stated before, the term "wandering Jew" has become a universal term during the long days of dispersion since Israel was cut off from its land by the mighty Roman Empire in 70AD. The Jews had been spread out over the “entire globe,” with no homeland until 1948, as we read in verses 65 and 66 which describes Israel’s plight while it was absent from its Promised Land – Israel! Jews were driven out of the land and dispersed after rejecting Yeshua (Jesus Christ). But it is important to note that they retained their identity among the new nations they call home, whether American, Ethiopian, South African, Canadian etc, the Jews have kept their identity and that in itself is a miracle! Let’s look at an example of how amazing this re-gathering of Israel to the Promised Land is. Tel Aviv was (is) the first all-Jewish city in modern times. Originally named Ahuzat Bayit, it was founded by 60 families in 1909 as a Jewish neighborhood near Jaffa. In 1910, the name was changed to “Tel Aviv” – meaning; “Hill of Spring!” It would seem the pictures speak for themselves. 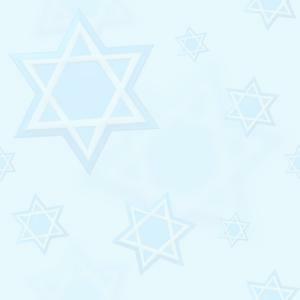 Since Israel’s come to being in 1948, it has become a vibrant, modern and well populated country. We pause for a moment and talk about something that is truly a great burden us and that is …the subject of “Replacement Theology!” We believe that it is a dangerous idea to get one-self believing in. You see there are those who say that God’s promises to Israel were cancelled …that God revoked them when they denied the Messiah …and therefore denied God for the last time. They say that the church has replaced Israel in God’s eyes! Although the church is very important, if we continue to study the Scriptures, especially those involved with the end times… it becomes very clear that God is not finished with Israel – yet! And, that the idea that the church replaced Israel is un-Scriptural! 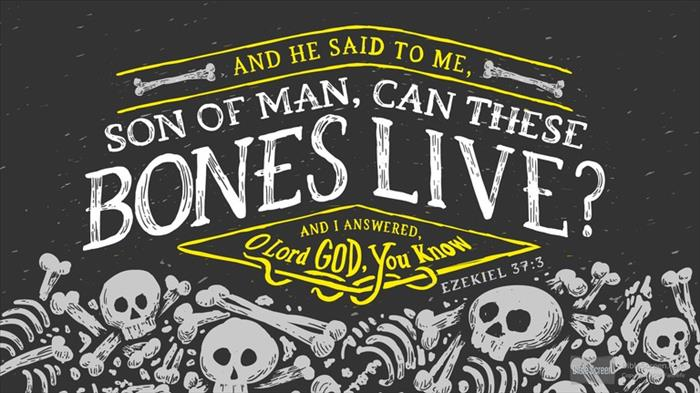 Well going back to Ezekiel’s vision, we find that he was compelled upon by the Lord to “prophesy unto those “dry bones” – “He said to me, ‘Prophesy over these bones,’ ‘Dry bones, listen to the Message of GOD!” Ezekiel 37:4. When God asks Ezekiel to prophesy to the bones it seems like a useless task! The message is that the bones would live again – Isaiah 26:19. The Scripture below is confirmation of God’s prophetic plan… "Has anyone ever heard of such a thing? Has anyone seen anything like this? A country born in a day? A nation born in a flash? But Zion was barely in labor when she had her babies!” Isaiah 66:8. Fortunately for Israel, it is not the “character of God” to NOT keep His Word. Someday, Israel will be blessed! The Abrahamic Covenant was a contract between two parties, but unlike a typical human contract, a contract with Almighty God is irrevocable. For almost 2500 years – starting with Jewish captivity under Babylon, then Persia, then Greece, then Rome; and almost 2000 since the birth and rejection of the Messiah the Jews were dispersed. (That in itself was a prophetic event due to Israel’s ‘falling way’ so to speak) The Jews were a people without a nation. 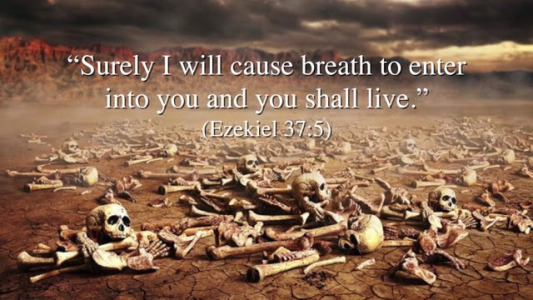 We continue with Ezekiel’s vision on “Dry Bones”… Ezekiel 37: 5-6 (MSG) GOD, the Master, told the dry bones, "Watch this: I'm bringing the breath of life to you and you'll come to life. I'll attach sinews to you, put meat on your bones, cover you with skin, and breathe life into you. You'll come alive and you'll realize that I am GOD!" The restoration to life would prove to people that God is Lord and giver of life. Recall that God made Adam from dust (Genesis 2:7) …surely He can restore life to dead bones. Remember, it is God whose just and righteous reputation to tied into Israel’s ultimate destiny. He has faithfully promised to make Israel a great nation, and to cause a “spiritual re-birth” within that nation! In the many centuries of their forced separation from their “homeland” the Jews never ceased to weep over the loss of their Prmised Land in 70AD … and never gave up the hope of a return someday to the to the land of their ancestors. The Prayer book of the Jewish Synagogue is replete with petitions for a restoration of the land of Israel. In the long centuries of Jewish dispersion, the land itself began to show effects of their absence. The land, while under the dominion of Arab rulers became a veritable wilderness; a dry and dusty place, but even in the short few decades since 1948 much of the land has regained much of its former “fruitfulness.” Israel is back in its land again …and as Amos 9:15 clearly states – that they will NEVER be cast out again! "I prophesied just as I'd been commanded. As I prophesied, there was a sound and, oh, rustling! The bones moved and came together, bone to bone. I kept watching. Sinews formed, then muscles on the bones, then skin stretched over them. But they had NO breath in them!” – Ezekiel 37:7-8. Israel in the 20th century has been resurrected from the Valley of the Shadow of Death, but still it does not know Yeshua (Jesus) as their Messiah. They have become a fleshly body but the spiritual life has not yet entered into the national body of Israel. Historically Israel can be faintly heard in - Psalm 79: 4-7 (MSG) beseeching God: We're nothing but a joke to our neighbors, graffiti scrawled on the city walls. How long do we have to put up with this, GOD? Do you have it in for us for good? Will your smoldering rage never cool down? On a lighter note – Did you know…? “Dem Bones” is a well-known traditional spiritual song often used to teach basic anatomy to children. The lyrics are based upon Ezekiel 37: 1-14 where the prophet visits the Valley of Dry Bones and brings them to life by mentioning God’s Name. Goes like this…Ezekiel cried, "Dem dry bones! "- Ezekiel cried, "Dem dry bones!" 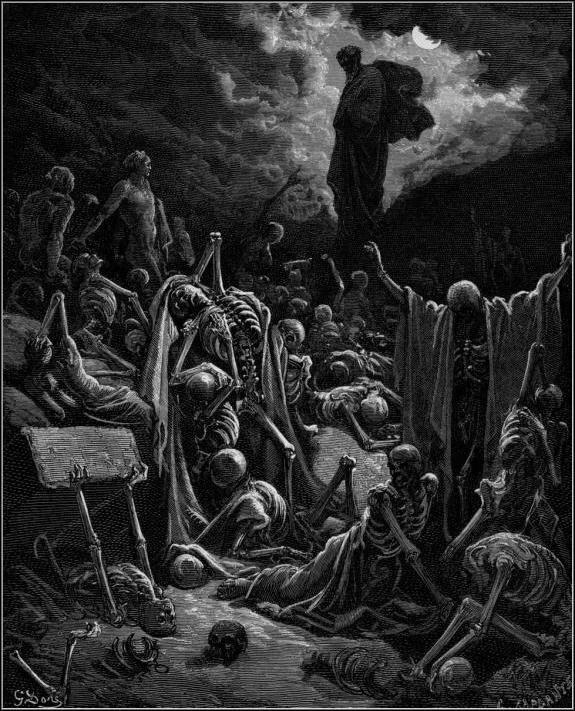 Ezekiel cried, "Dem dry bones"- "Oh, hear the word of the Lord." The foot bone connected to the leg bone. The leg bone connected to the knee bone. The knee bone connected to the thigh bone. The thigh bone connected to the back bone. The back bone connected to the neck bone. The neck bone connected to the head bone. "Oh, hear the word of the Lord!" Dem bones, dem bones gonna walk aroun’. (3 X’s) "Oh, hear the word of the Lord!" In Ezekiel 37:3 and verse 11 we can see that the Lord refers to Ezekiel as "Son of man." We know that Yeshua (Jesus) was the living incarnation of God; who being born of a woman became the "Son of Man." It is only the "Son of Man" (a name Jesus referred to as himself in the Gospels) who can breathe the breath of life into anyone, and for Israel to attain the life of the Spirit; it too will have to acknowledge the “Son of Man” as its awaited Messiah! Unfortunately, Israel has steadfastly disassociated them from concurring that Jesus was the one sent from the Father to be their deliverer. So Israel today still cries out in mourning with pleads for deliverance. But, rather than cry out to the Lord Jesus Christ, Israel yearns for acceptance by the world. Having given Jesus to the world, the Jews have found themselves in tragic position of unrecognizing a divine move of God which became the faith of much of the rest of the Christian world. However Jewish history is definitely moving toward the analogy Ezekiel utilized in verse 14, a verse describing the days after the Lord brought them back from the “Valley of Dry Bones! Make no mistake about this point… Israel would NOT be back in its rightful land today if it were not God’s will and God’s design! No other people in the world can boast of such high authority for the title to their earthly land deed. It is rooted in the Word of God, which all Christiann nations are to respect! Before1948 there was NO Israel! Not one of Israel’s prophecies could ever come to pass without a nation. It was during this time that the idea of replacement theology came about. No Israel? – God must have meant them symbolically… So you can imagine why the “Study of Prophecy was all a buzz in 1948… All of a sudden! Having lived and worked in Turkey for over seven years, we had the privilege to study Muslim religion of Islam and their Quran. You may be thinking what has this to do with Israel…? Well you would be surprised to hear that their Quran actually declares that Israel (Holy Land) belongs to the Jews! The Old Testament is NOT the only document to declare that Jews are entitled to their Promised Land; it is fascinating to note that there are a number of passages (known as surahs) in their Quran, as declared by Mohammed that relate to the “Children of Israel” and their right of the Holy land! These passages in their Quran, though ignored by the Arabs are very intriguing in that they clearly acknowledge and affirm the right of the Jews to possess the Land of Israel! But, their Hadith (Islamic traditions attributed to Mohammed) declares negatively: "The Day of resurrection will not arrive until the Moslems make war against the Jews and kill them, and until a Jew hiding behind a rock and tree, and the rock and tree will say: ‘Oh Moslem, Oh servant of Allah, there is a Jew behind me, come and kill him!’" (This Hadith was quoted by Sheik Muhammed Abd al Hadi La in and official Palestinian Newspaper – 18th May, 2001. We will quote two of the Surah’s from the Koran that affirms Israel belongs to the Jews… "And when Musa (Moses) said to his people (Israel): O my people! Remember the favor of Allah upon you when he raised prophets among you and made you kings and gave you what he had not given to any other among the nations. O my people! Enter the Holy Land which Allah has prescribed for you and turn not on your backs for then you will turn back losers (Surah 5:2021). It is worthwhile to note that this passage actually declares that this territory of Israel was for the Jews and was not given by Allah to any other people. Specifically the Quran affirms to Israel that “Allah made you kings and gave you what he had not given to any other among the nations. This statement is confirmed in several other passages in the Koran, including Surah 17:104: "And We said to the Israelites after him: Dwell in the Land: and when the promise of the next life shall come to pass, We will bring you both together in judgement. Well after reading this you may wonder why the Arabs are still fighting to kill the Jews and take away the land rightfully belonging to the Jews since God gave it to them… If the Islamic peoples of the world, especially the Arabs, were to carefully read these passages, it might allow them to sit down and negotiate peace in the Middle East with the Jewish people…? However the Word of God reveals that the Middle East will not find true peace until the Prince of Peace returns to set up His Kingdom on earth. Elisha’s bones remained potent in the grave! You can read this in 2 Kings 13:20-21 – (the virtue wasn’t in the bones of Elisha but in the power of God). Which just reveals to us that God is in control of our universe and that He shows Himself Strong through the impossible…? It is a MIRACLE that Israel is a Nation, and against all odds! The Story of Masada… (for those who don’t know) Herod the Great’s desert fortress (built between 37 and 41 BC), comes to life in a new museum. It is an amazing place to visit and overlooks the Judean desert! When we visited (Julie & me) we went on the tour. The display, at the museum spanning one century, combines archaeological findings, exploring Masada in the Roman-Hellenistic period where the Jewish refugees who fled to the mountain fearing the cruelty of the Romans rather than surrender, they chose to commit suicide! One can almost "see and feel" the sadness of their last night – dramatic fall of the fortress on Passover AD 73. War Bulletin: God’s Message concerning Israel, GOD’s Decree - the very GOD who threw the skies into space, set earth on a firm foundation, and breathed his own life into men and women: "Watch for this: I'm about to turn Jerusalem into a cup of strong drink that will have the people who have set siege to Judah and Jerusalem staggering in a drunken stupor." On the Big Day, I'll turn Jerusalem into a huge stone blocking the way for everyone. All who try to lift it will rupture themselves. All the pagan nations will come together and try to get rid of it, Zechariah 12:1-3. How many Cities in the world are larger than Jerusalem…? How frequently do these other Cities make World News…? Do these other Cities “tremble” and incite as much anger as Jerusalem…? How can one City invoke such controversy in our large world…? Jerusalem does because God willed it and is making it happen! Israel is very much part of God’s plan…! So why is the fact that Israel was re-born as a nation in 1948 an important event to the of Biblical Prophecy….? Because: Antichrist will make (or reaffirm) a 7 year covenant with Israel. Daniel 9: 27 …Antichrist will invade Israel and desecrate the temple. Daniel 11:40-41; Matthew 24: 15-20 …Gog and his allies will invade Jerusalem – Zechariah 12:1-9; 14:1-2 …The people of Israel will flee into the wilderness to escape the wrath of Satan – Revelation 12:13-17. Pray 4 Zion is based on Psalm 122:6 was raised up ‘For a Time Such as This’ will not be silent. We are committed to speak up for Israel and thank God for giving us partners to stand with us and be a blessing to Israel. Thank you. We pray for each of our partners personally each day and truly thank the Lord for you. We truly have learnt much and enjoyed studying on the subject of Ezekiel 37 and trust that you will be blessed too. May God bless you and your family with His perfect Shalom!